Just one week after saying she wasn't "going to even deal with" rumors that she was suffering from pancreatic cancer, Aretha Franklin is finally speaking out. The 68-year-old singing legend underwent surgery for her undisclosed health problem in December and now says things couldn't be better. Meanwhile, Franklin has a biopic about her life in the works and wants Halle Berry to play the older Aretha. But Berry, 44, isn't quite sure she's up for the task. "I can't sing! " the Oscar winner told E! 's Ryan Seacrest, according to the Hollywood Reporter. "If I could carry a tune, I'd consider it. 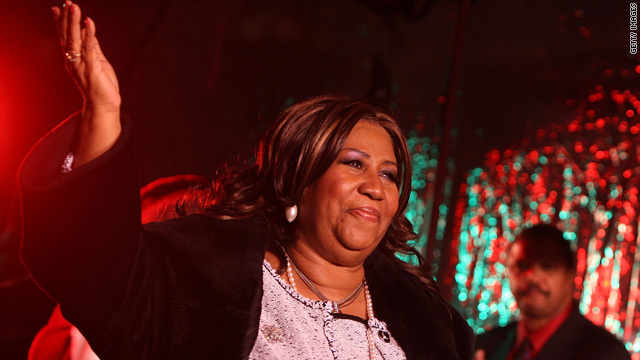 Someone should tell Aretha that I can't do her justice." I do believe all of the ideas you've presented for your post. They're really convincing and will definitely work. Still, the posts are too quick for starters. May you please extend them a bit from next time? Thank you for the post. Simply desire to say your article is as surprising. The clarity to your submit is just great and that i could assume you're a professional on this subject. Well with your permission let me to grab your feed to keep updated with impending post. Thank you 1,000,000 and please continue the gratifying work. I do not even understand how I finished up right here, but I believed this put up used to be good. I do not understand who you're but definitely you are going to a famous blogger if you happen to are not already. Cheers! Hello, Neat post. There's a problem together with your web site in internet explorer, would check this? IE nonetheless is the marketplace leader and a large portion of other people will miss your excellent writing due to this problem. I have been exploring for a little for any high quality articles or blog posts in this sort of area . Exploring in Yahoo I ultimately stumbled upon this web site. Studying this info So i'm glad to express that I've a very just right uncanny feeling I discovered just what I needed. I most for sure will make certain to don?t fail to remember this website and give it a glance on a continuing basis. Lets face it we are doing just what Aretha expected and needed. PUBLICITY! A few years ago she was talking to Fantasia about portraying her. But no one seemed to have been interested in making a movie of her life. Then the mysterious illness and now the talk is back. That much weight loss...gastric bypass. I have never know anyone to survive of pancratic cancer. Michael Landon-dead. Patrick Swazey-dead. Just to name a couple that comes to mind. Time will tell if the rumor was true. Aretha Franklin, Aretha Franklin, I wanna rock with you. Whoever plays her should be a good actress more so than singer since they should use Aretha's voice. I just saw her on The View, Her singing is kinda off, but bless her soul. And I think she was more like over 400 lbs. I am glad she is ok and maybe 150 now. Really! She is the true Queen of soul, and yes, Jenifer Hudson could do the part. Actually the "CORRECT ANSWER" concerning Areatha's health is ......... "LET IT BE"
ARETHA FRANKLIN IS AND SHALL BE ONE OF MY FAVORABLE SINGER, HOWEVER, I THINK SHE WAS DISREPECTFUL TO FANTASIA(TRIBUTE TO ARETHA FRANKLIN) AS FOR HALLE BERRY PLAYING THE QUEEN OF SOUL, OUT OF THE QUESTION, J HUDSON OR FANTASIA WOULD DO NICELY, WHY? BECAUSE THEY BOTH CAN REALLY SING. Pancreatic cancer patients lose a lot of weight. My father died from this cancer, he loss a lot of weight from it. I find it kind of weird for her to just cancel her shows, like she did. I hope she does not have the cancer because it is a killer, i feel for anyone with pancreatic cancer. well, I don't really think Halle would do the role justice . . . . Queen Latifah has a strong presence so she would probably be great both physically and talent wise. Don't get me wrong I like Halle and Jennifer would be also a good choice for her vocal style and at one time for her physical aspect, what about Gabouree ??? Aretha wasn't always overweight you know. She was quite svelt in the day . . . but she loves food . . . I can relate to that. comments, I'm convinced. She looks great. I noticed she said the doctor told her the surgery could add years to her life. Sounds like weight reduction (Gastric Bypass) surgery to me. Glad to hear you are doing good, Aretha. I too saw the queen on the 53rd grammy awards program and she looked fantastic. I had no ideal she had been in the hospital, when i saw her my mouth fell open, she looked 20 years younger. God Bless her, i hope she is able to keep the weight off. I believe if she will pray and ask the Lord for help he will help her. Money and fame cannot buy us real joy, oh it helps true enought but real joy comes from the Lord Jesus Christ. In his presense is the fullness of Joy and the Joy of the Lord is our strength. It doesn't matter if she had the bypass operation, that is her business and she do not want the tell anyone, it is ok. I am glad that it is not cancer, and I am sure she is too. So you haters can take a hard long look in the mirror at yourself. You may be small in size, but so are you in character. Aretha has gotten to where she is only by the Grace of God, and no one can take that from her. She knows the right way and it is by choice if we accept it! We all have the opportunity to accept Jesus as our personal Savior before we leave this earth! Anyone who reads this comment and have not accepted Jesus this is your golden opportunity to confess with your mouth right where you are, I accept Jesus, I believe he is the son of God and he rose from the dead. I just adore Aretha Franklin and wish we all the good health in the world. She has brought such joy and happiness to people all over the world. Jennifer Hudson has the voice to play her, no one else does. Don't think she has cancer. It's never been confirmed by a reliable source. My belief is she had gastric bypass surgery and is doing a "Star Jones". She was well over 300 lbs before surgery and has dropped at least 100 lbs. As anyone knows – with cancer comes chemo or rad therapy and Franklin has had nothing of the sort. Shame on you all with the comment about Aretha Franklin,she's an icon and I'm from the old school, the sister can still blow,so get over it.Stop the negative and be thankful that Aretha Franklin the lady of soul is in [ God hands not yours are others] take a look at yourself,because we all are not perfect. i know that Jennifer Hudson can play the [ Lady Of Soul ].Call on her now.May God Blessing heal my soul sister body mind & soul. A real Aretha fan, not a hater. This lady have entertain most of you hater parents(Black, White and all other races around the world, with resapect) not worry about your weight or health problems, Why do the manf=gers of these blogs let these attacks on people continiue. You try to read the blogs for meaningful comments not trashy ones. Would you really comment on Jesus like this? aretha franklin is the queen of soul and loved inn detroit.fat or small she served are parents and grand pa,and never turned her back on detroit. aretha was a very nice looking women in her days.now she,s older and the weight is there she,s the same person now as she was then.i love her and alway,s will. love you queen. Oh im soo happy. We have already losy way to many great. We lost luther,michael, and coutless others. Im praying that she makes a full recovery because i would die of of a broken heart if anything happens to her. About the movie, jennifer hudson would do a splendid job. Love you much areatha! One person we all have forgotten about to play Aretha has been away from the screen for many years yet is great when it comes to acting. Anyone guess to whom Im referring? YEPPERS...Jubba The Hut. Just add a nappy wig, some obnoxious earrings and nasty makeup and there you have it. When you look in the mirror, do feel sadness or self hatred? Do you feel like crying? (Steve Harvey Show) resembles Aretha during her early years? I think that Terry can carry the role throughout. Don't know if she can sing, but it is apparent that singing is not a requirement, as Halle has never demonstrated this particular talent. What a fat ole hippo. Hurry up and die already ya obese pig. You are indeed a sad person. I wish her the very best and a quick recovery. Hey you Urethra, how about a little kindness in this world...It's people like you that make the world what it is. I sure hope that Aretha doesn't have pancreatic cancer. I do know that she is very private and don't like to talk about personal issues. So I guess time will tell if she does have cancer. She is certainly a true icon and we don't want to lose her. But she definitely needs to work on her weight issues. Because that could be what's causing her health problems. Oh, I am so grateful to the Almighty God above that Aretha is okay. After loosing Michael Jackson and KoKo Taylor I felt domed myself. That lovely voice just sends me to unknown heights. I myself am a blues singer working on a cd here in Jackson, Mississippi and she is one of my mentors. And now I feel that I still have a chance to meet her face-to-face. I want to see her. I have got to see her. I just feel if I could just talk to her, I just really don't know what would happen to me. Aretha need to know that her so called man Mr. Wilkerson is her snake. He is using her. I'ts funny how all the other women know it but her. She is in denial. Wake up ReRe. He can't wait to cash in on your funds. Along with me and others he is the one who said she has pancreatic cancer and only had so long to live and that she is just covering up. Fire him. I know him personally and he talks about her like a dog. These are facts and not lies. Be smart. If something is wrong Ms. Franklin don't leave him a one penny. Wishing you well and hope you do have a full and successful recovery. Does that mean she had gastric by-pass surgery? I AM SO HAPPY TO KNOW THE QUEEN OF SOUL IS GOING TO BE OK. GOD BLESS YOU!! I'm sure she had gastric bypass surgery. Here I was worrying that Aretha had pancreatic cancer and was in a countdown mode, but the inference that she had gastric bypass surgery rings true! Her weight was absolutely out of control, and she had expressed concern about it on a number of occasions. I hope that is the case. No cancer please! Jennifer Hudson would be a great choice to play Arehta! Halle Berry? I don't think so. If the powers that be are reading this and are looking for a great unknown, undiscovered talent, Fonda Cross from Omaha NE would be an excellent choice for playing Aretha as well. She's done some local work with actor John Beasley who has appeared in a number of TV shows and plays. Most recently I saw him on "Harry's Law" (he played a judge) which stars Oscar winner Kathy Bates! OMG!! She is delusional as usual!! A few years ago she was in the hospital at Thanksgiving(I believe was the Holiday) and she put out a press release with all the foods she was having. WHO CARES!! I'd rather see a biopic on Phyllis Hyman or Patti Labelle. Like everything else about Aretha, she has an INFLATED ego. Lady Soul, you have come along way, Look where He brought you from. then look through some old and new albums and just think who could be you! Think, the just ain't no way for you to be best portrayed by these artiist! Aretha is an absolute LEGEND! But, she needs to do something about her huge weight. There are some negative and mean spirited comments on this blog. Why can't you just be happy she is doing well and keep the negative comments to yourself or do you think everything about you is perfect and you have a right to put others down. Look in the mirror and judge yourself before commenting. Queen Latifah is Pearl Bailey. That would be an awesome biopic. If she had surgery and is now down to a size 18 "and my doctor said it will add years to my life" I m sure that is what she had done. Why can't the just admit it ? Another Star Jones. She had "Gastric Bypass Surgery" But for some reason like Star Jones, she cannot be honest about it? She wants Halle Berry to play the "older" Aretha? Does anyone see the irony here? Halle Berry?!? No way Aretha!! Not even close. She probably had some type of surgery for weight reduction, and like Starr (Star) Jones she's just lying about it. Better to address it than keep getting the publicity. This "Queen" has no CLASS. So rude. Did you ever consider IF she did have weight loss surgery and doesn't want to share that information with the world that doesn't make her a liar – just none of our business? Get a life. WOW there are some serious trolls on this article. Aretha's the Queen of Soul for a reason. I'm very happy to hear you're OK; we and the Blues Brothers hope you have a long, great life. I think they should get John Goodman. Not sure if he can sing though. If Chris Farley were still alive he'd be perfect. Goodman can't do it now. He lost 100 lbs. Aretha gained weight as she grew older but was small when her career began. Check her earlier work out on You Tube. Therefore if size dictates casting a "skinny actress" could portray her. The weight remarks are just mean and vicious. Yeah, but come on, her career began 150 years and 15,000 pieces of bacon ago. I agree Queen Latifa would do great job in this role. Queen Latifa would be a great casting. She can sing, act, has star quality . I think she has excelled at everything she has attempted. A terrific challenge for her and a great and respectful portrayal for Aretha. Queen Latifa would not be a good match. but she sure could play pearl bailey; same kind of mannerisms and features, right down to those big eyes. That's okay Halle; Aretha can't sing either. Ever try to understand the words when she sings? Can't be done due to her mumbling style. Possibly a lap band surgery for weight loss? I agree.. either a lapband or gastric bypass..loosing that weight could definitely ad years to your life span. Regarding the Evel Kneivel comment. Was it really necessary to refer to Aretha as an elephant I suppose you are the best looking thing that ever walked the face of the earth. You represent what is wrong with America! Too many people being born without brains or respect for others. Maybe instead of an elephant they can get Gilbert Gr@pes mom. Glad Aretha is fine; but leave it to her egomaniacal self to want Halle Berry to play her. As if there were any similarities between those 2 whatsoever, not! Hope she loses some of that over inflated ego with the pounds. I agree with you 100% Her ego is so over-inflated that it is sickening! For real! Not a nice woman! Most interviews you feel like she's doing you a favor to talk. some of u are so ignorant until it aint funny....you dont have to be heavy to play areatha as she was growing up, she wasnt that heavy when she started singing. and as we all should know, that u dont have to be able to sing these days to play any kind of singing part, its a plus, but not necessary, and to play her in later years, all the produers have to do is fit them with exta paddings. and besides that, most of what she did in her life as far as her singing and performing was done when she wasnt as heavy as she is now. and of course some one else could step in and play her as she gained the weight,. its not ego, as long as i have followed her career, she has always been a very private person and didnt want to put much about herself and private life out in the public. Rain Pryor could to an incredible job! Let's be real....Jennefier Hudson already won the Oscar for Dreamgirls (the supreme's), and now she went from an Aretha size to a size 4. I am sure she doesn't want to gain all of it back again. Halle Barry is one of the most beautiful women of the entire world. Aretha is one of the most incredible soul singers of all time, but for beauty, she's a one or a two. I say get Gabourey "Gabby" Sidibe who got the Oscar for Presious. They favor each other. people today need not have to gain weight for every role, their are all kinds of ways that they have today that can make some one appear to be heavier than they are.on tv, films and plays. no one these days need to gain weight to play a certain roles in this day and age. their are all kinds of technology today. Notice she really didn't deny the pancreatic cancer rumors? But all the best to Aretha. And uh...NO, Halle Berry cannot play you (good sense Halle). I think Loretta Devine would be the perfect person to play Aretha.. She is old school and she can sing. This is wonderful news. God bless you, Aretha, and here's to many more years of good health and stellar soul. Aretha I am so glad to hear this was just a rumor, because this world would not feel right without you in it. I love you Aretha Franklin always. The world loves you!